Just Julie B's Stampin' Space: Butterfly Greeting Card Set & Caddy! 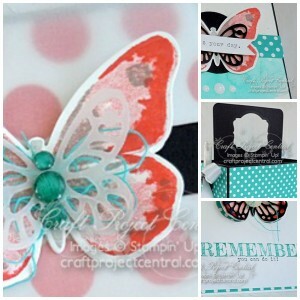 Butterfly Greeting Card Set & Caddy! Make this feminine greeting card set with a matching caddy that will hold your cards and envelopes. The caddy is easy to make and can be refilled with other stationery items later. It is also a pretty décor item on any desks. Make four greeting cards to go in the caddy, using the same butterfly embellishments and lay-outs, but with different background techniques that will come handy for future craft projects. Great for a stamp camp, or as a class project. This pretty project was made by Monika Davis, and you can get her tutorial when you subscribe to the month of July over at Craft Project Central. Watering Can Decor Gift Set! Swallowtail Card Set & Box! All Boxed Up for Class this Week! Floral Monthly Card Organizer & Cards! Summer Garden Tote Gift Set!